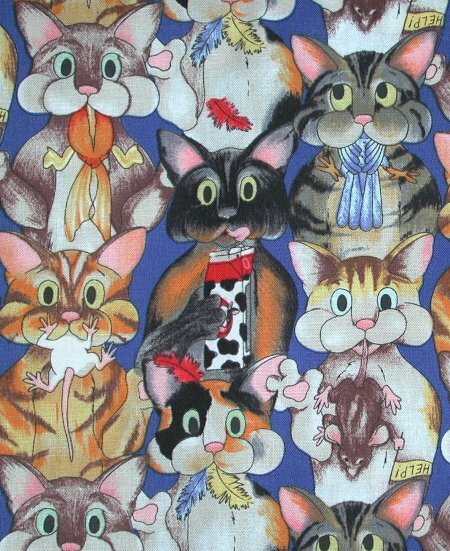 The cover of the October 2000 issue of McCall's Quilting (Creative Ideas for Today's Quilters) featured the most adorable cat quilt I've seen in a long time. Cute design and easy construction .. just my cup of tea (two lumps of sugar, please). I thought it would be the perfect block for a swap on About.com's Quilting forum, where I have been an active participant., I knew a huge number of us on the Forum not only are owned by the furry felines but have cat fabric up the gazoo, as well. "Please feel free to use the pattern. It is actually inspired by a pattern from Janet Kime and her purpose was to allow the patterns to be used to help support animal shelters across the country. This is the purpose Robert had in mind when he made his quilt. So, we feel it is equally "okay" for you to use this pattern as well. Give credit where it is due to either Janet or Robert, and you shouldn't have any other problems in using the pattern." Digression: To make the swap easy for my participants, I put the directions on a webpage for the group. This swap proved to be so popular that it spanned many, many sequel on About's Quilting Forum. It also was taken to other forum on other networks. A question was brought to my attention about the propiety of these subsequent swaps using my website directions. I had assumed that since McCall's had granted permission for me to use it in one swap, any futher swaps would also be OK. But, just to be sure, I contacted McCall's again. They replied that while they didn't mind the block being used in a swap, they really did want each swap hostess to ask for her own permission. Wow .. this was a surprise to me! So, I took down the directions on my website and replaced it with an explanatory page of why the directions were no longer there. 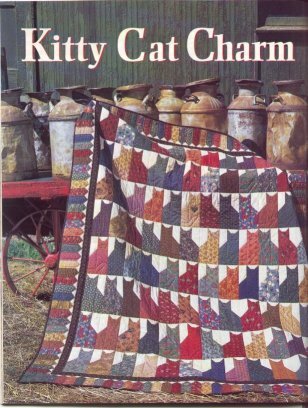 I did a search on Janet Kime and discovered that she is a talented quiltmaking teacher and lecturer who has written five books for That Patchwork Place. She and her goats live on rural Vashon Island in Washington State, where several cats allow her to share their home. One of the swap partipants (Charlene) found out that this block is in one of Kime's books, "The Cat's Meow". The pattern is Susan's Cats. My original swap yielded only a portion of the total number of blocks needed for the size quilt I wanted, so 2 more swaps were done so that at least *I* could get a quilt top out of the blocks! 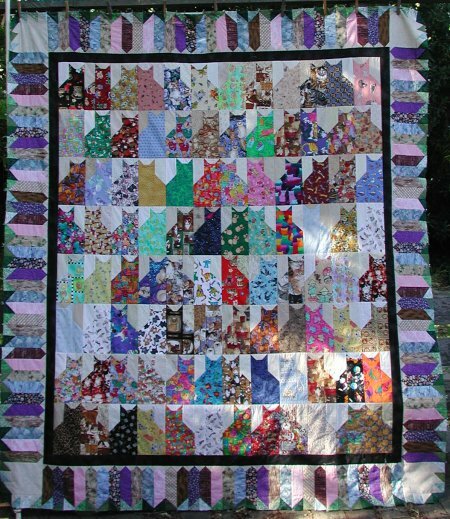 Since I hadn't quite thought through the entire quilt when I started the swap, the picket fence fabrics are totally different from the cat block fabrics. Ah well .. live and learn. What I should have done is ask everyone to include a piece of fabric to make a certain number of picket fences too ... but that's water under the bridge. Since I *didn't* have matching fabric, I originally decided to make my picket fence out of various wood and stone fabric, sort of a realistic fence. But as I perused the stores, I saw some absolutely wonderful "building material" fabric but in different colors. I realized that I really didn't need to stick to "realistic" fence fabric since the cats are anything BUT realistic. :-) So, I started collecting my unrealistic fence fabric, but still within (more or less) "building material" appearance. Then, because I just can't leave anything along, I decided that I would have tufts of "grass" at the bottom of my picket fence (cuz I'm not a very tidy landscaper) and put HST of fence/green fabric at the bottom of each fence block. However, I believe I am pleased with the overall effect of the quilt and absolutely ADORE everyone's block! One of the participants (DorothyA of Vermont) even made me a pirate cat block! I took the quilt to a local longarm quilter and together, we came up with a plan of attack. She quilted a swirly design on the cat bodies (balls of yarn that cats chase; the gyrations that cats go thru when indulging in the "cat crazies") and a spikey design on the grass tufts. It all came out so nicely! For the backing, I ran across an "M.E. Hordyszynskifor Michael Miller" selection, specifically, "The Cat's Meow". It was absolutely hysterically funny! It has all sorts of feline hijinks, such as drinking milk out of a carton, having a mouse tail dangling from a mouth, catching birds, etc. I really DID LOL when I saw it! And to head off all of you politically-correct people from sending me horrified emails: don't bother. I'm not in the bit interested in your PETA concerns. This is fabric, fer cryin' out loud. It depicts exactly what cats do. If you don't like what cats do in nature, that is YOUR problem, not mine. Don't bother me about it.